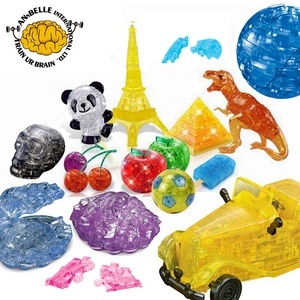 10 YRS Shantou Chenghai Xiangfa Arts & Crafts Co., Ltd.
: QS100614006 Description: CRYSTAL PUZZLE(44PCS) Pack: C/B Product Size: 0.00&times;0.00&times;0.00 CM Carton Size: 64.00&times;40.00&times;60.00 CM Q'ty/Ctn: 120/PCS Measurement: 0.153 CBM G.W/N.W. : QS100614016 Description: CRYSTAL PUZZLE(45PCS) Pack: C/B Product Size: 0.00&times;0.00&times;0.00 CM Carton Size: 64.00&times;40.00&times;60.00 CM Q'ty/Ctn: 120/PCS Measurement: 0.153 CBM G.W/N.W. 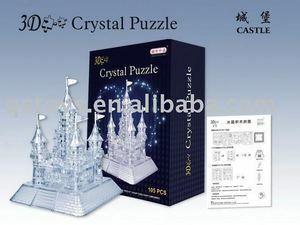 : QS100614010 Description: CRYSTAL PUZZLE(45PCS) Pack: C/B Product Size: 0.00&times;0.00&times;0.00 CM Carton Size: 64.00&times;40.00&times;60.00 CM Q'ty/Ctn: 120/PCS Measurement: 0.153 CBM G.W/N.W. 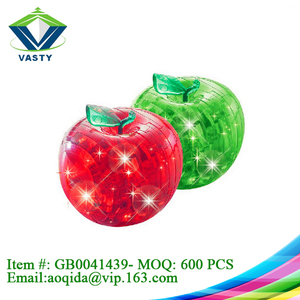 educational toys,summer toys,sport toys and so the customers to send us what you are searching for. We also can provide ODM & OEM services, and seek to mutual development and long-term cooperation with you . 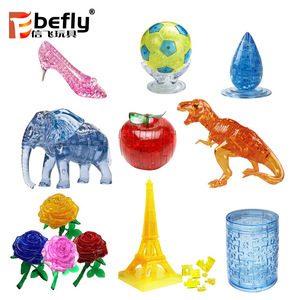 educational toys,summer toys,sport toys and so the customers to send us what you are searching for. It can be assembled many times, and can be as the hanging ornaments. There are 3 color assorted: red, blue and green. It is suitable for the children more than 6 ages up. 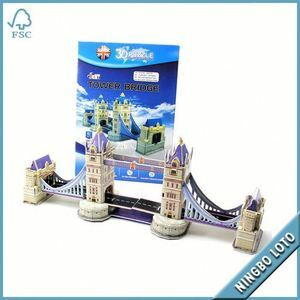 Alibaba.com offers 413 3d crystal puzzle products. About 50% of these are puzzle, 10% are blocks, and 7% are crystal crafts. 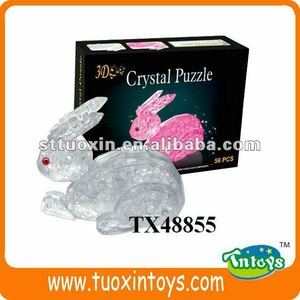 A wide variety of 3d crystal puzzle options are available to you, such as diy toy, construction toy, and cartoon toy. 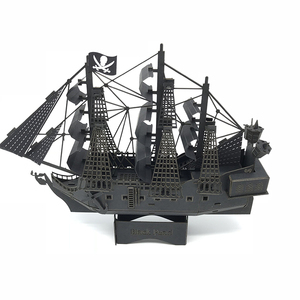 You can also choose from 3d, block set, and jigsaw puzzle. As well as from plastic, crystal, and paper. 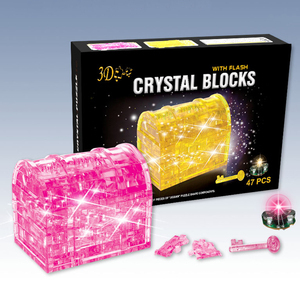 And whether 3d crystal puzzle is abs, pp, or ps. 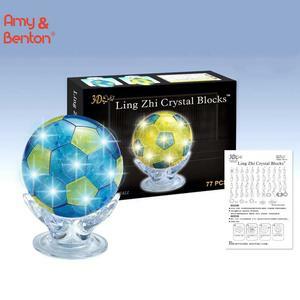 There are 413 3d crystal puzzle suppliers, mainly located in Asia. 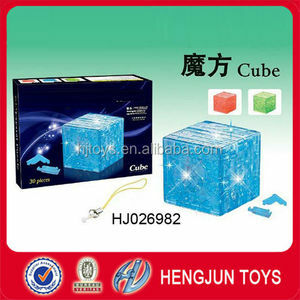 The top supplying country is China (Mainland), which supply 100% of 3d crystal puzzle respectively. d crystal puzzle products are most popular in North America, South America, and Eastern Europe. You can ensure product safety by selecting from certified suppliers, including 63 with Other, 42 with ISO9001, and 24 with FSC certification.